Average commission rates for real estate agents fell nearly 1% in 2017 and this trend is appearing in the National Association of REALTORS® 2018 member profile. The median gross income for surveyed REALTORS® dropped 6% from $42,500 to $39,800. While this decrease clearly impacts REALTORS®, for the majority of brokers– whose business models are based on commission splits, either fixed or graduated — this trend also has significant impact. Multiple factors contribute to this downward pressure on commissions. The interest mortgage rate has been climbing upwards. As of August 2018, major mortgage lenders are quoting a rate of 4.6%, up from half a point from the beginning of the year. As the rate begins to affect housing affordability, so does the significant shortage of homes for sale and the strong demand from buyers. To further compound the downward pressure on commissions, real estate professionals must compete more fiercely for listings as housing starts have decreased by 12.3% due to rising construction costs and an intense labor shortage. Additionally, the client’s knowledge of the home buying process has significantly improved in the last 5 years. They are shopping around more, comparing services different brokerages offer along with the commissions they will be expected to pay. All this is happening in a market where new brokerage models are entering the industry to increase competition. Redfin’s 1.5% listing commission and 3% buyer commission with salaried agents has shown there is room in the market for alternative models. REX, a brokerage in Los Angeles, quotes a 2% listing commission and 0% buyer commission. Tech-forward brokerages like Compass are quickly acquiring well-known firms to spur its ambitions for national coverage. And eXp Realty has pushed the low overhead model with a completely virtual office. Recently, competitors such as Purple Bricks from overseas or Redefy – from within the US – have launched flat fee models of $3,000-$3,200 to list a property. 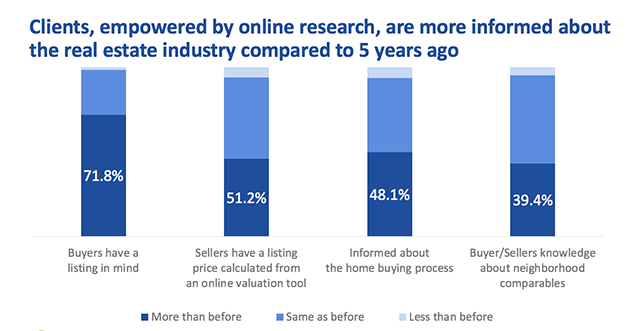 Lastly, the iBuyers like Opendoor and Offerpad are looking to purchase homes, taking on the inventory risk in the hopes of holding or renovating them to increase their value. While these brokerages differ in their fee structures and how they compete, there are commonalities between these brokerages. First, they all still recognize the need for the human element in a real estate transaction: agents. Second, in order for them to thrive with compressed commissions or flat-fee structures, they must all operate more efficiently. And lastly, they all rely heavily on technology to decrease overhead (from office space, file storage, printing) costs and improve agent productivity to ensure the viability of their model. Reducing overhead and improving agent productivity requires offices to find ways to reduce busy work for agents when they are preparing documents. Filling out the same information over and over again with the same information only wastes time. Brokerages need their agents to provide a secure and easy to use signing experience. That way, the agents can spend more time developing relationships rather than chasing documents. Administrative staff and transaction coordinators can better spend their time ensuring compliance rather than manually entering information from signed agreements into accounting software or other systems. And offices should eliminate overhead costs from storing documents and stop wasting time manually retrieving them. These steps can transform your current system of agreement into a modern platform that will empower your brokerage to compete effectively against new business models. To find out more about how your brokerage can optimize their office processes and increase agent productivity, read DocuSign’s new white paper written by Geoffrey Moore, author of Crossing the Chasm here.